The decanting of acid mine drainage (AMD) from the Western Basin on the Witwatersrand in late 2010 raised concerns about AMD risks in other gold, coal and copper mining areas of South Africa. Field spectroscopy and the use of vegetation indices could offer an affordable and easy means of monitoring the impact of mine water and/or AMD on vegetation. The impact of raw and treated mine water or contaminated soil on wetland vegetation often manifests in growth inhibition and reduction of foliar pigments and nutrient levels. Surveying the impact on wetland vegetation or underlying soils can be difficult and expensive considering the cost of laboratory analysis of samples. The potential of field spectroscopy for detecting the impact of mine water on wetland vegetation was examined by assessing (1) whether there was a significant difference in leaf spectra between sites receiving mine water and a non-impacted control site and (2) whether there was a gradation of vegetation condition downstream from the decanting site. 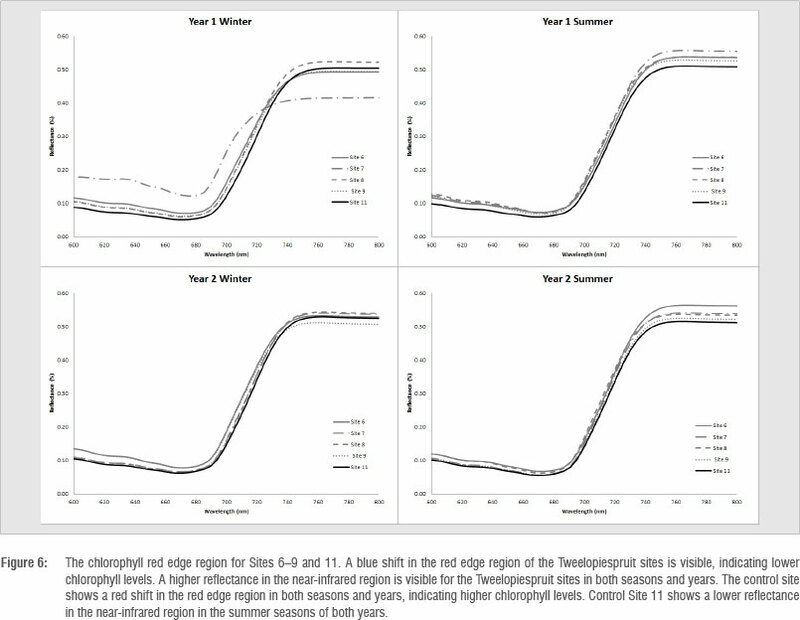 Two vegetation indices were derived from portable field spectrometer-measured spectra of five green leaves of Phragmites australis - the chlorophyll red edge position (REP) and the normalised difference vegetation index (NDVI) - for two dormant (winter) and peak growth (summer) seasons in 2011-2012. Mean REP and NDVI values were significantly (p<0.05) lower for affected sites compared to the control site for both seasons and years. The range of REP values for young green leaves in winter for affected sites was 695-720 nm compared to the narrower range of 705-721 nm for the control site. The mean REP values for young green leaves in winter was 708 nm for the affected sites compared to 716 nm for the control site. The downstream gradation, however, fluctuated for REP and NDVI over the study period. We conclude that field spectroscopy shows potential to serve as a relatively quick and affordable means to assess the condition and health of vegetation affected by AMD. The decanting of acid mine drainage (AMD) from the Western Basin gold mining void in South Africa, in late August 2010, highlighted the environmental risks of AMD.1-3 AMD occurs through the exposure to oxygenated water of the naturally occurring mineral iron disulphide (FeS2).4,5 A number of chemical reactions result in the formation of ferrous iron, sulphate and acidity.4,5 The solubility of trace and heavy metals in the environment increases when exposed to AMD,2 which results in increased levels of these metals in water, sediments or vegetation. The exceptionally high rainfall since 2009 in the Witwatersrand region increased the groundwater discharge and enhanced the formation of AMD in the historical gold mining voids. Existing pump and treatment facilities could not accommodate the increased AMD volumes which decanted through historical incline and ventilation shafts.2,3 Other sources of AMD are open-cast coal and copper mines elsewhere in South Africa, as well as mine dumps, that contain iron disulphide and are exposed to oxygenated rainwater.1,3 AMD decants into natural wetland systems, and affects natural ecosystems and agricultural lands.3,6 The extent and magnitude of the impacts of AMD need to be determined and monitored to provide a basis for effective management. Assessing the geographical extent and degree of impact of mine water on vegetation is time consuming and costly, considering the deep intricate root systems of macrophytes and trees. Often, contaminated soils are covered by vegetation and difficult to access.18,19 The cost of laboratory analysis of samples for various minerals or chemicals can hugely increase the cost of assessments and continuous monitoring. Monitoring techniques for assessing vegetation health should consider feasible, practical and affordable solutions, even if these are mere surrogates of vegetation health. Trace and heavy metal contamination in the receiving water or substrate or adsorbed into the plants can cause varied responses in vegetation spectra.18,24,25 Zn was found to cause a traditional blue shift in the REP with a decrease in the NIR24, and similarly the radionuclides Cs and Sr at Chernobyl were highly negatively correlated to the REP green and NIR regions26. An opposite trend was observed in plants exposed to Cd24, Pb27, a combination of heavy metals (As, Cd, Cr, Cu, Pb and Zn)18 and radionuclides26, in which the REP decreased and the NIR increased with exposure. Chlorophyll response was found to correlate only partly with metal contamination18,19, in some instances estimated as merely 30%28. This finding may be attributed to the unique absorption patterns and storage location of heavy metals in plants12,29, hence spectral responses may also be unique to plant species25. The efficiency of remote sensing may require that relevant indices be investigated for each site, species and set of mine water conditions prior to use in monitoring. Phragmites australis, Typha capensis and alien poplar trees (Populus x canescens) are known to tolerate conditions associated with mine water.19,30 These species are largely found in natural wetlands in South Africa. Phragmites australis, known to be tolerant to low pH levels, reduces the uptake of heavy metals through plaque formation at its roots30, yet still adsorbs a significant amount and releases a low amount of heavy metals, and so is considered appropriate for use in phytoremediation31-36. Metals are mostly stored in rhizomes, with lower concentrations in stems and leaves, although certain metals are exceptions.35,37-40 Compared to Phragmites australis, Typha capensis and poplars are less prevalent across both disturbed and pristine wetland types in South Africa, and therefore provide less opportunity for monitoring downstream from a decanting site. Poplars are also less suitable for monitoring because they often are targeted for invasive alien species control. The aim of our research was to assess whether leaf-level spectroscopy could serve as a means of assessing and monitoring vegetation health impacted by AMD. Leaf reflectance of Phragmites australis sites affected by a combination of raw and treated mine water was compared to that of a control site to determine if there were differences in spectral indices of vegetation health. 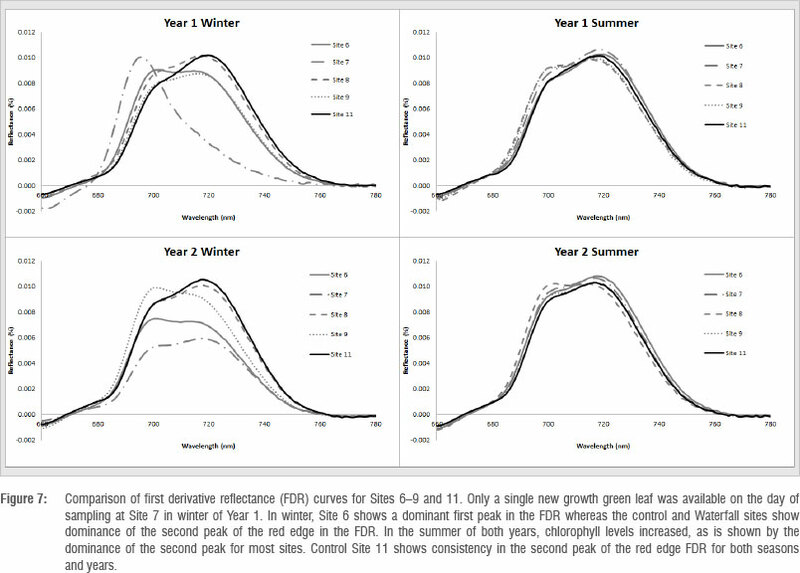 Green leaves in the dormant and peak growth seasons were sampled for a 2-year period. Two vegetation indices were derived from the leaf spectra: the chlorophyll REP41 and the normalised difference vegetation index (NDVI)42,43. The variation of these indices was also assessed per site to determine a gradation of vegetation condition with distance downstream from the mine water source. The study area was located along the Tweelopiespruit (around 26°06'S and 27°43'E) situated west of Johannesburg, South Africa (Figure 1). The word 'spruit' refers to a creek or small tributary stream. The Tweelopiespruit is the first drainage to receive mine water discharge from the West Rand Goldfield (i.e. the Western Basin), and joins its main stem - the Rietspruit - some 6 km to the north of the mine water source (Figure 1). The region experiences a mean annual rainfall of ~700 mm44 with characteristically wet summers and dry winters. The geohydrology of the study area is complex, comprising contiguous dolomitic karst aquifers and quartzitic fractured rock aquifers which produces complicated drainage patterns and varied groundwater recharge dynamics.2,45 Dolomitic springs along the reach of the Tweelopiespruit contribute ~2 ML/day to this drainage. Mine water decants onto the surface commenced in August 2002 via boreholes and shafts (two ventilation shafts - Winze 17 and Winze 18) and an abandoned incline (the Black Reef Incline).45 A high density sludge (HDS) treatment plant with a capacity of ~12 ML/day was commissioned to manage this decant, and the neutralised product is then released into the Tweelopiespruit, generating a perennial flow of similar magnitude. Natural run-off during the rainfall season increased the stream discharge to ~24 ML/day for a mean annual flow of ~18 ML/day. These circumstances prevailed until early 2010, when recharge during an abnormally wet summer precipitated unmanageable quantities (>40 ML/day) of raw mine water discharge.46 A return to pre-2010 water chemistry and flow conditions was only achieved in mid-2012 as a result of a combination of factors, most notably a reduction in rainfall and the commissioning of a refurbished HDS treatment plant with a greater capacity of ~24 ML/day. The hillslopes on the mine property are dominated by grassland, except for the narrow artificial wetlands in the stream channel, which are primarily dominated by Phragmites australis. Downstream of the mine property, the combination of treated and untreated mine water flows through artificial wetlands in the Krugersdorp Municipal Nature Reserve for a distance of about 5 km. Being a relatively small sub-catchment (38 km2), run-off and potential contamination from adjacent land uses are minimal. The wetlands are primarily dominated by Phragmites australis and large stands of Populus x canescens. The Tweelopiespruit exits the reserve prior to its confluence with the Rietspruit (Figure 1). Our sampling sites were designated Sites 1 to 9, and two additional sites (Sites 10 and 11) were added as controls (Table 1; Figure 1). Control Site 10 was chosen for comparison of the water chemistry and trace element levels in the sediment and Phragmites australis as it had similar geology to the Tweelopiespruit. Control Site 11 was chosen for comparison of the leaf spectra results to the Tweelopiespruit. Control Site 11 (Figure 1, inset map 1) is located approximately 24.5 km north-northeast in the valley of the Skeerpoort River (25° 53' 40" S; 27° 45' 48" E), which flows through the John Nash Nature Reserve. This area receives a similar mean annual rainfall of ~700 mm.44 The Skeerpoort River, fed by dolomitic springs yielding a total discharge2 of 9.5 Mm3/annum, is considered to be in a near pristine condition. The site has shown no land use impact for the past 50 years, and, in particular, has not experienced any AMD impacts. Average water chemistry (measured since 1964) shows mean pH as above 7, EC at 32.4 mS/m (s.d.=2.58) and mean sulphate levels as 8 mg/L (s.d. = 3.8). The control Phragmites australis population occurs here on the edge of an artificial wetland. A study was conducted in 2009 to compare the AMD chemistry of the Tweelopiespruit sites with a non-AMD control site. 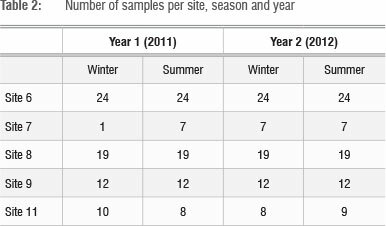 Water, sediment and plant material were collected in the winter of 2009 from five sites along the Tweelopiespruit (Table 1, Sites 1-5) and at a control site (Site 10). At each site, sediment was collected from 100 mm below the water column, in close proximity to Phragmites australis. Specimens of the rhizomes, stems and leaves of Phragmites australis were also collected at each site and subsequently dried in an oven at 65° C for 3 days. Water samples were analysed for pH, EC and sulphates (SO4), while element concentrations in the water, sediment and plant material were assessed using inductively coupled plasma elemental analysis. Green leaves of Phragmites australis were sampled in 2011-2012 to compare the physiological differences between the sites affected by AMD (Sites 6-9) and a site not impacted by AMD (control Site 11). 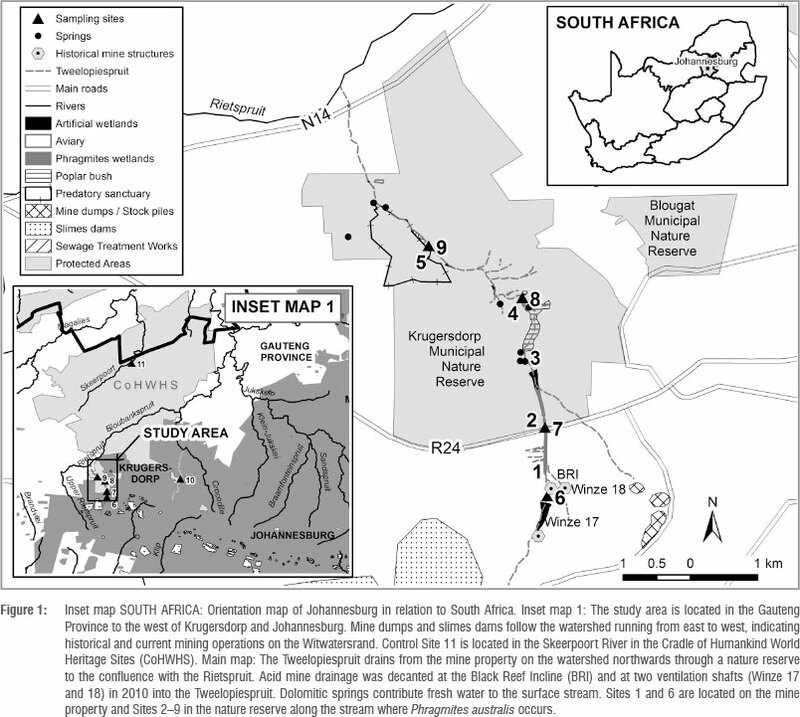 Sites 6-9 are situated on the Tweelopiespruit (Figure 1) and control Site 11 in the unspoilt Skeerpoort River valley (Figure 1, inset map) in the John Nash Nature Reserve at the chalets. Phragmites australis occur here on the sides of an artificial wetland flanked on both sides by indigenous trees. At each sampling site, sampling points were selected based on the availability and accessibility of green leaves during the dry period (June 2011). Sampling was carried out in the dormant (winter) and peak growth (summer) periods of 2011 and 2012 (Table 2). At each sampling point, five green leaves were collected for leaf level spectral reflectance measurements from five different stems of Phragmites australis within an area of 4 m2. In the winter, these leaves were primarily small green leaves of new growth, whereas in the summer they were large mature leaves. The raw and derivative reflectance spectra were used to explore the differences between sites and seasons. For each vegetation index, the mean and standard deviation values were derived for sites affected by mine water and for the control site for the two seasons and years. 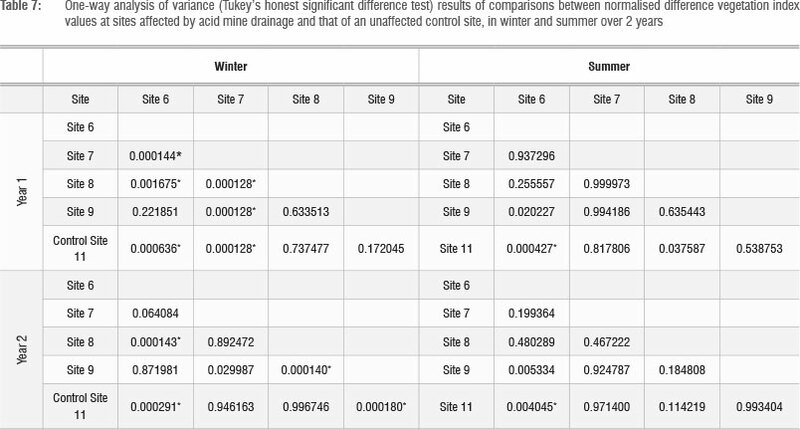 A one-way analysis of variance (ANOVA) and post-hoc Tukey honest significant difference (HSD) test were performed in Statistica (version 7, StatSoft Inc.) to assess the significance of differences between the sites affected by mine water and the control site. In addition, the mean and standard deviation values were calculated for each site for the two seasons and years to investigate the variation in gradation from upstream to downstream. ANOVA and post-hoc Tukey HSD tests were repeated to assess differences between sites for the sampling periods. The pH and EC show an improvement downstream of the decant site (Table 3), yet no consistent trend is shown in sulphate levels downstream. A high concentration of heavy metals (Table 3) was found in sediments and the rhizomes, stems and leaves of Phragmites australis. Sediment samples taken from the top 100 mm on the sides of the wetlands show that the highest values for As and Fe were recorded at the decanting site (Site 1) and Site 5, whereas Al was the highest at Sites 2 and 5. Cr, Pb and Zn measured highest at Site 4. Site 5 (or Site 9) show the highest measurements for Cu, Mn, Ni and U, although Cr, Pb and Zn also were high at Site 5. Metals accumulated primarily in the rhizomes of the reeds with lower concentrations in the aerial parts. No consistent trend could be noted for all the metals downstream from the decant site. Overall, the average reflectance spectra of green leaves for both winter and summer of the 2 years show normal vegetation curves peaking in the green, absorbing in the red and having high reflectance in the NIR region (Figure 2). The average reflectance spectra for the affected sites are higher than that of the control site in the visible region (VIS) over the two winter periods, although are very similar in the NIR. Both summer periods show higher average reflectance spectra in the VIS and NIR for the affected sites in comparison to the control site. Both winter and summer seasons over the 2 years show a blue shift for the affected sites, compared to control Site 11 (Figure 3). The double peak feature41,48 and blue shift is particularly visible in the winter season of the first year (Figure 4), and less obvious in the second year. The behaviour of the double peak feature of the first derivative in the red edge region between 660 nm and 780 nm was captured in the linear extrapolation REP model by Cho and Skidmore41. The dominance of the first peak (at around 700 nm) is associated with low chlorophyll and the dominance of the second peak is associated with high levels of chlorophyll.41 The control site shows a dominance of the second derivative peak (at about 725 nm) in the red edge region when compared to the affected site (Figure 6). Hence, the control site shows high levels of chlorophyll for all the sampling periods, compared to the affected sites. In the winter of both years the differences between control Site 11 and affected sites are particularly visible, with the affected sites showing medium levels of chlorophyll compared to the control site, which shows higher levels of chlorophyll (Winter Year 1 and Year 2 in Figure 4). 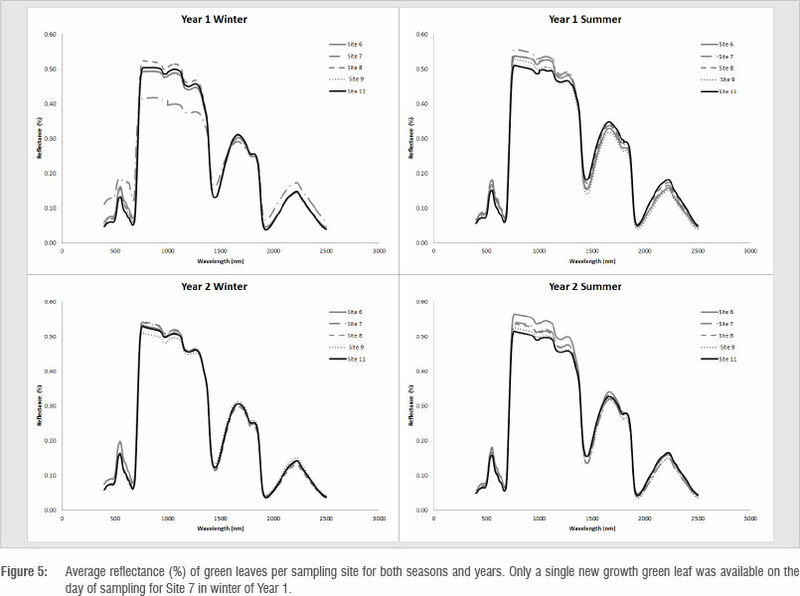 When comparing the average green leaf reflectance of each site over the two seasons and years, the control site seems to have lower reflectance in the VIS region than the other sites throughout the time periods (Figure 5). The control site shows more dominance of the second red edge derivative peak around 720 nm when compared to the affected site. In winter, the control site reflectance lies within the range of the other sites for the NIR region of the spectrum. In summer, however, it is lower in the NIR compared to the other sites. None of the affected sites show particular differences compared to the others in average reflectance spectra over the sampling period. Most of the sites show a blue shift for the winter and summer seasons over the 2 years, compared to the control site (Figure 6). Leaves of the control site seem to have higher chlorophyll absorption levels compared to the affected sites in both winters (Figure 7). In the summer months, the affected sites appear to have slightly higher chlorophyll absorption levels compared to the control site. In the winter of Year 1, Site 7 shows the most stress. Only a single new green leaf was available at this site for sampling. The leaf structure is least developed (Figure 6, Year 1 Winter, Site 7) and chlorophyll levels are much lower compared to all the other sites. These observations support the circumstances that describe the period of greatest raw mine water discharge into the Tweelopiespruit. The single leaf sampled in Year 1 Winter at Site 7 also is evident in Figure 7, where the second derivative peak shows a blue shift towards 690 nm and no double peak feature. 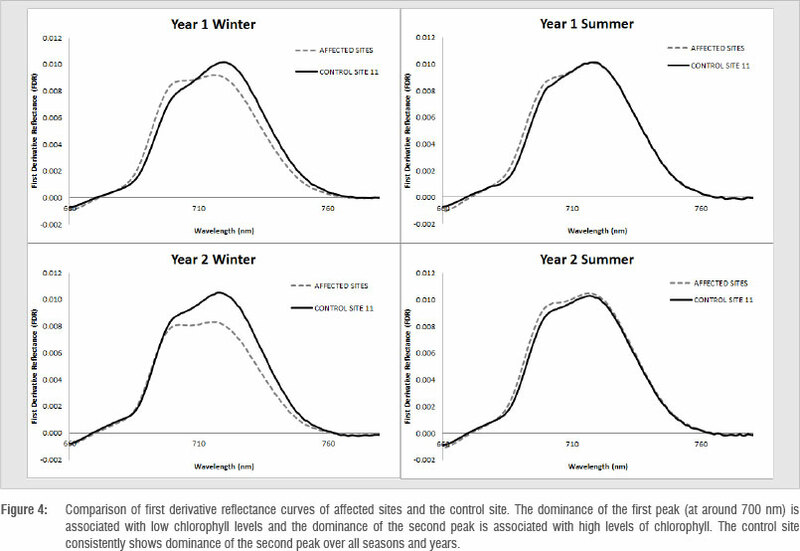 There is a greater variation of chlorophyll absorption levels, the location of the second derivative peak and the double peak feature between sites during the winter season (Figure 7, see Year 1 and 2) compared to the variation of these features between sites in the summer seasons. In the winter, Site 6 shows a double peak feature in the second red edge derivatives, with the change in the first peak around 695 nm more prominent compared to the second peak near 720 nm. In the winter of Year 2, Site 9 follows a similar pattern. In contrast, Site 8 matches the slope of the control site more closely for both winters, with the peak near 720 nm. In the summer seasons, the profile of the second red edge derivative peaks are closely matched for all sites. The affected sites tend to medium levels of chlorophyll (a double peak profile), compared to the higher chlorophyll levels of the control site (profile skewed towards second peak) for the summers of Years 1 and 2. The affected sites show more change in the second derivative profile around the first peak, near 690 nm, compared to the control site. For all the sites, the control shows the strongest dominance of the second derivative peak, indicating the highest levels of chlorophyll. REP and NDVI values between the affected sites and the control site for each season and year show significant differences (p<0.05). 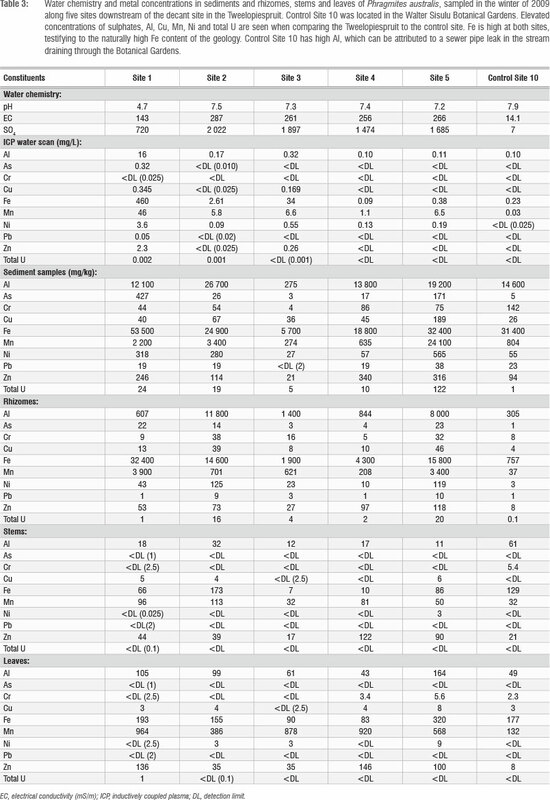 Sites affected by mine water had significantly lower REP values (p<0.05) over the two seasons and years compared to the control site (Table 4). 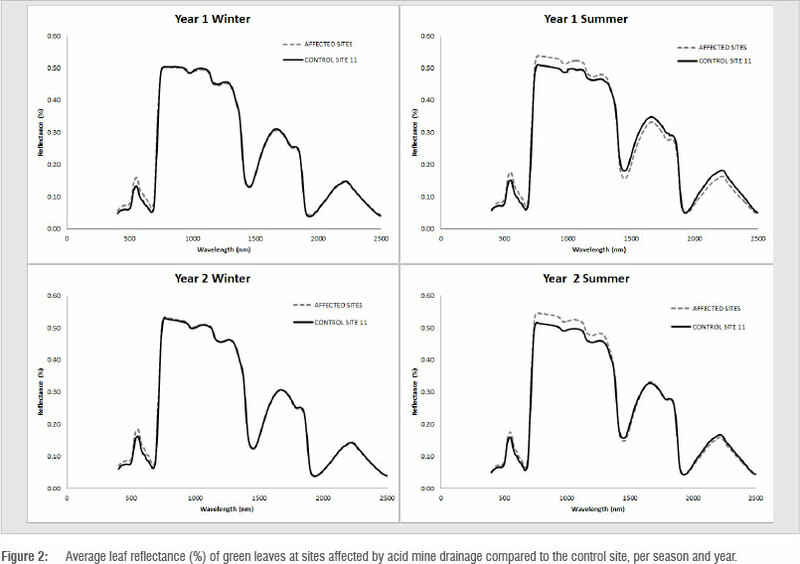 Sites affected by mine water show a higher variability of REP values in winter compared to the summer seasons. The average REP value increased from winter to summer for the affected sites, and decreased slightly in the control site for the same period. NDVI values also show a greater variation in the winter period for the affected sites compared to the control site (Table 4). In all instances, the ranges of NDVI values of the affected sites and control site overlap largely for both seasons and years. Average NDVI values in the winter were significantly lower (p<0.05) for affected sites than for the control site, whereas the average NDVI values in the summer were closer in value. Generally, average REP and NDVI values in winter increase from Site 6 to Site 8 (downstream) and drop at Site 9 (Table 5), except for Site 2 in the winter of Year 1, where only one new green leaf was available. In summer, an opposite trend is noted for average REP values: in general, the average REP decreases downstream from Site 6 to Site 8 and then increases again at Site 9. Average NDVI in summer shows less distinct patterns downstream of Site 1. 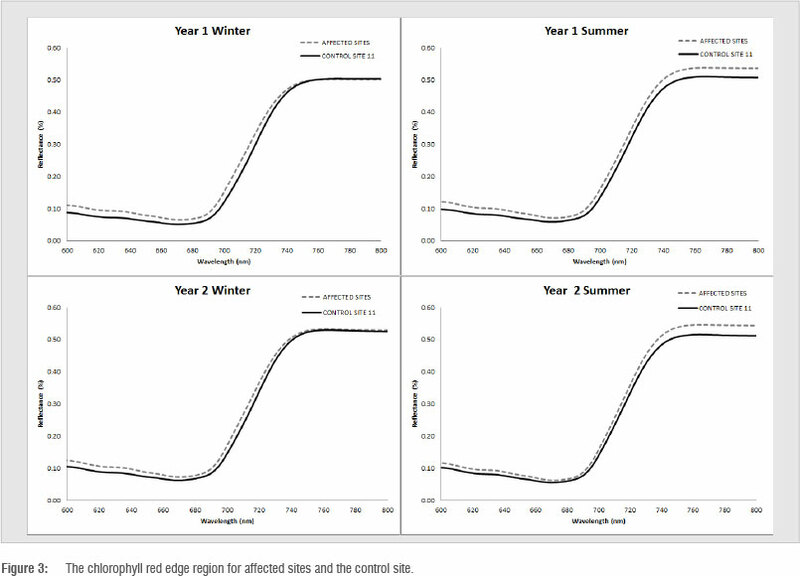 For the first three sites (6, 7 and 8), average REP in summer decreased from Year 1 to Year 2, whereas the average NDVI values decreased in winter and increased in summer. There appears to be a gradient of the REP values only in the winter of Year 1. On average, the control site values change slightly over the 2 years; however, affected sites (Sites 6-9) show more fluctuation, particularly in REP values. When comparing all sites to one another (a combination of 10 pairs; Bonferroni-corrected p <0.005), Sites 6 and 11 are significantly different from one another in both seasons and years for both REP (Table 6) and NDVI (Table 7). Sites 6 and 8 also differ significantly for both seasons and years for REP. Few significant differences between sites are noted for NDVI. Field spectroscopy shows potential as a means to assess the impact of mine water on wetland vegetation and to monitor impact over time. The REP and NDVI values for affected sites were significantly lower compared to the control site for both winter and summer seasons over the 2 years. The mean and standard deviation of REP and NDVI can therefore potentially serve as surrogates for establishing impact on wetland vegetation and monitoring vegetation condition over time in other areas of South Africa. It remains to be established whether the method is site and species specific, or whether it also applies to other sites regardless of mine water characteristics and environmental conditions. 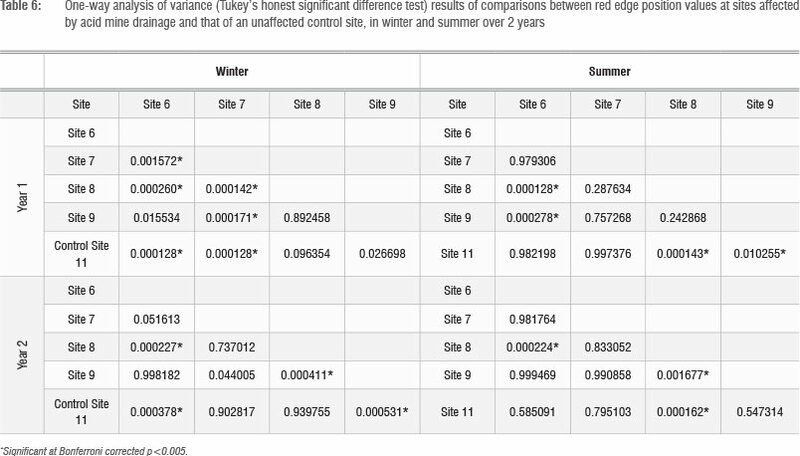 Winter seasons presented more distinct differences in REP and NDVI values between affected sites and control Site 11. In addition, leaves of control Site 11 seemed to have higher chlorophyll absorption in the winter of both years, based on the dominance of the second derivative peak of the first derivative spectra of the REP region. The opposite trend of an increased reflectance in the NIR (i.e. biomass) and a reduction in chlorophyll (or REP values) was, on the other hand, particularly visible in the summer months, similarly to findings reported by others.24,27 The pattern was, however, less distinct in winter months, although leaf maturity may influence the responses in both the red and NIR regions in this instance. Both REP and NDVI showed significant differences between the affected and control Site 11; however, in comparison, REP and NDVI values for individual sites yielded fewer significant differences between affected sites and control Site 11. The inconsistent responses of REP values of individual sites affected by AMD compared to control Site 11 are similar to those noted for Phragmites australis at two affected sites compared to a control site in Hungary.19 Regardless, the presence of high levels of, among others, Al, As, Cd, Cr, Cu, Fe, Mn, Ni, Pb, Zn and total U in the soils found in parts of the Tweelopiespruit47 may have a toxic effect on plants, hence at some sites the REP and NDVI indices show significant differences from control Site 11. Metal concentrations in sediments at particular sites were found to vary, not only as noted by Venter et al.47 at, for example, the Hippo Dam wetland, but also between the two studies at similar sampling points. Variation in metal concentrations may be attributed to the natural variation of water depth, flow and presence of vegetation in parts of a wetland. Variations in stream flow and pH during rainfall periods, when a larger volume of raw mine water and AMD floods through the spruit, would also cause changes in the bioavailability of metals from the stream bed and vegetation, contributing to further temporal and geographical variations in metal concentrations. In any event, the differences between sites are difficult to explain and can be attributed to a number of possible factors influencing the signatures. Further exploration of temporal and spatial variation of the metal concentrations and affected vegetation is essential to further the understanding of the impact of AMD in the Tweelopiespruit. Funding for this work was provided by the CSIR as part of the Strategic Research Panel (SRP) acid mine drainage (AMD) project. Our gratitude is extended to the following individuals and institutions for providing access to their properties: The South African National Botanical Gardens, Rand Uranium / Gold 1, African Bush Adventures, Mr S. du Toit of Mogale City local municipality, Mr J. Rykaardt and Mr H. Rykaardt of Protea Eco-Adventures, and Mr H. Visser of John Nash Nature Reserve. We thank Dr J.F. Durand for his advice and fieldwork support. We are also grateful to CSIR colleagues and project participants for support and advice, including Dr B. Genthe, Dr P. Oberholzer, Mr P. Hobbs and Dr R. Mathieu. We are thankful to three anonymous reviewers whose suggestions assisted in improving the publication. H.v.D. contributed to the experimental and project design, undertook the fieldwork and statistical analysis, and wrote and revised the manuscript. M.A.C. was responsible for the experimental and project design, and the paper structuring, editing and revision.